Asus officially announced 6 new models of the Windows 8 PC at the Asus Windows 8 event in New York, namely, the VivoTab, VivoBook, the Transformer Book, the Touch Zenbook, the TAICHI, and the Asus All-in-One. 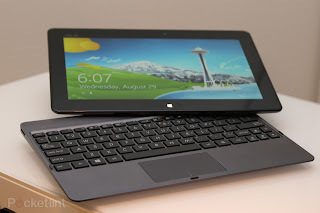 The Asus Vivo Tab RT proved to be a great competitor. The VivoTab RT runs Windows 8 RT and it packs a Tegra 3 processor bundled up with 2 GB of RAM. It has got 32 GB of inbuilt storage. It features a 10-inch touchscreen having a resolution of 1280 x 800 pixels. It starts at $599, which is $100 more than Microsoft’s Surface. There’s a Vivotab with a 11-inch screen and Atom processor, called the VivoTab Smart, that will run a full edition of Windows 8, and that starts at around $499. The VivoTab Smart Similar to the Asus VivoTab, and other than that smaller touch screen packs similar specs such as 2GB of RAM, 64GB internal storage, a 1.8GHz Intel Atom Z2760 dual core processor, and sports an 8 megapixel camera with LED flash and F2.2 lens on its rear, whilst the front camera is a 2 megapixel snapper. The Asus VivoTab Smart also offers 1080p video, that 10.1-inch touch screen is a 1366 x 758 IPS display, there’s NFC, 802.11b/g/n WiFi, Bluetooth 4.0 and the slate will also become available in a variety of LTE and HSPA+ configurations, and there is a Bluetooth keyboard as an option as well. The Smart version proved out to be much better than its predecessor. 0 Respones to "ASUS VIVO TAB HANDS ON"